I love wearing oversized button-down shirts. They are so easy and comfortable. By doing a half-tuck in front, it provides a little more definition. I styled this with skinnies and heels as a casual evening look but love the idea of wearing this with distressed boyfriend shorts and sandals this summer. Going to the beach? Leave it un-buttoned as a flowing beach cover-up. In the mood for super-casual? Wear this with leggings and cute sneakers. If you follow us on Instagram, you might have seen me wearing this with my distressed jeans and casual jewelry over the weekend. 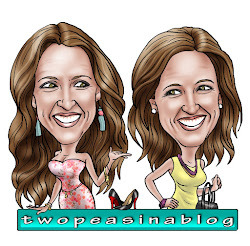 This week's featured blogger is Tara from Miss Tara Brooke. We recently came across her blog and love how her personality and realness comes across in all her posts. Not only is she a beauty sharing her love of fashion, she's a hairstylist, the owner of Be More Collection, and also a new mama. Be sure to check her out! On to today's Link Up! 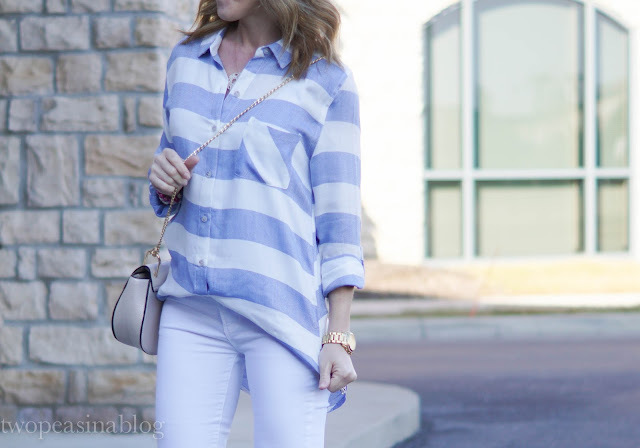 I LOVE this striped blouse, doll! So cute! This outfit makes me sooo excited for spring!! Love the white!! Woohoo ... bring on the spring! Your striped top is so nice with the white jeans, such a lovely outfit. Love this shirt, super cute look! You are such a lovely vision in pastels - Have a great week! Ahhh, these gorgeous stripes make me feel "Spring!" Love it!! 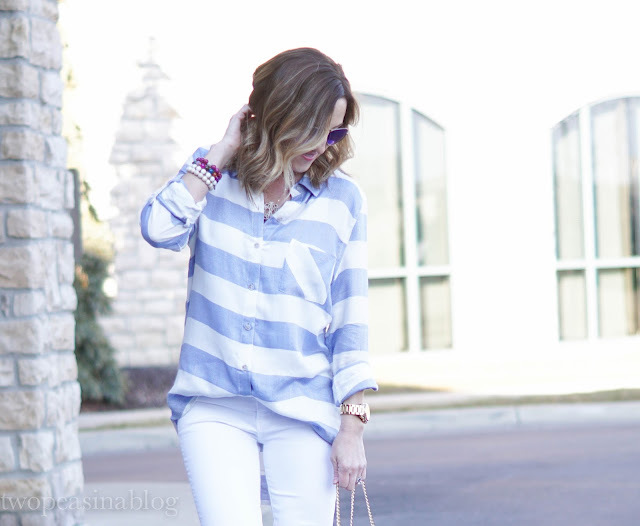 Love the stripes and white jeans! I wish it was spring like here! This is such a chic spring look! Love how effortless it looks! I am loving the over sized blue strips so cute and great for spring!! Love this look! That Shirt looks so comfy and cozy! 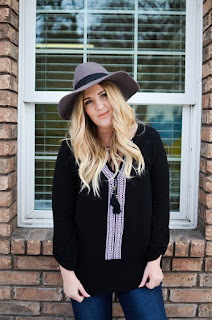 I'm a sucker for oversized blouses, and am loving yours! It looks great paired with the white jeans! Love the oversized look on you! 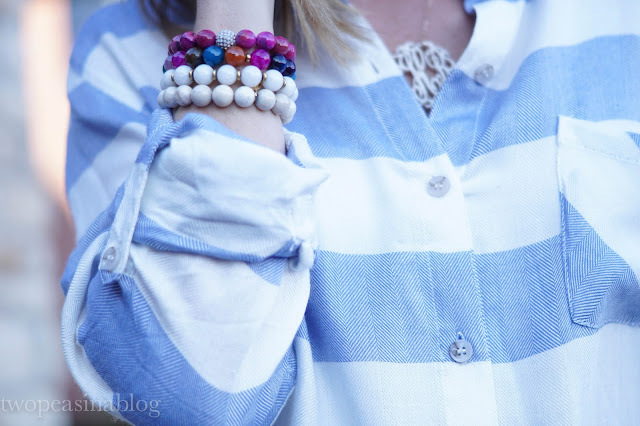 The colorful bracelets are such fun accessories! This look is making me have major Spring fever!! Love your top! Great look! OMG Love this top!! Its in my shopping cart right now. I might just have to pull the trigger now that I see how precious you look in it. Stay warm this week. What an easy, breezy outfit. LOVE that shirt! I'm loving that striped top!! It has me ready for spring! Enter Express Gift Card Giveaway HERE! Love the casual feel of this top! what a perfect look heading into spring! I'm forever grateful to whomever invented the half tuck. Love the mix of the oversized shirt with the skinnies and heels. Nice ,,fresh'' outfit. I love the bag!